If the storyline of last week was the number of injuries to RBs, then this week it was the strong play of a number of defensive units, with the Minnesota Vikings leading from the front. The Vikings were the surprise package this week turning over the Carolina Panthers, although the Bills also did a number on the Arizona Cardinals. The storyline of this fantasy matchup was the resurgence of 3 players who were being questioned either before the season or over the last couple of games. Before the season began DeMarco Murray had been written off as washed up, Philly gave him away to the Titans for next to nothing and since that move he has started to look like the Murray of old. In recent weeks talk was swirling around Aaron Rodgers, had we seen the best of him? Was he only a good quarterback? 14 straight games without a passer rating over 100... Well he silenced those critics, at least in the first half before Green Bay took their foot off the gas. Finally Devonta Freeman turned up to the 2016 party. He's still sharing time with Coleman in the Atlanta backfield but this game was classic Freeman. Over 200 combined yards, a receiving TD, the only thing missing was a rushing TD (Coleman had 3). There may be a running back by committee system in Atlanta right now but it was Freeman who was the star of the show regardless of how many TDs Coleman put up. 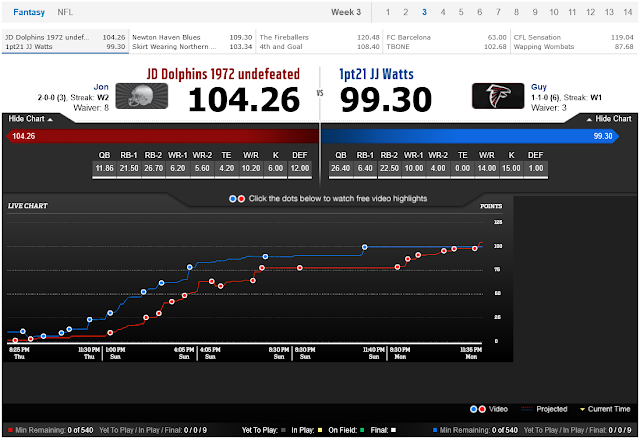 Devonta Freeman's big game snatched victory from the jaws of defeat on Monday night, hopefully there will be more to come from my first round draft pick. 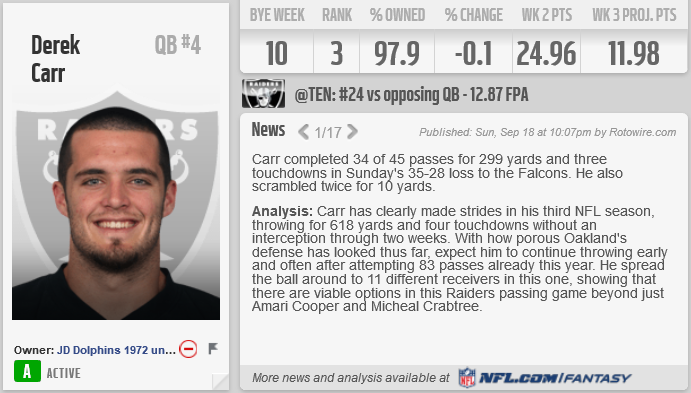 There was always going to be at least one game where Oakland's Offence and Derek Carr stumbled a bit but I didn't expect that to happen against Tennessee. He threw for the fewest yards this season (249) and his first interception but still managed to throw one TD. In contrast to his earlier games this season Carr had a strong first half against Tennessee before he was shut down in the second, this was also the first time that the Oakland D turned up for a game and that could be related to a slower second half showing as Carr and co did not have to chase down a big total from their Tennessee counterparts. He's still a top QB this year, sitting just outside the top 5, and will look to bounce back against a Ravens team that has started 3-0. I had honestly thought that DeMarco Murray was going to be the talk of the show for my RBs but then Devonta Freeman delivered a show stopping performance on Monday Night Football. He took advantage of a weak New Orleans defence to put up more yards than his combined totals from weeks one and two. Next up for him is Carolina which will be a tougher prospect, especially as they will be looking to bounce back after Minnesota embarrassed them on their home turf. It would be remiss of me to completely gloss over the performance of DeMarco Murray here. He has been my most consistent backfield performer and this week has been his best yet. His first 100 yard rushing performance with an additional 40 yards through the air. Week on week he is improving his yardage and you would expect TDs to follow. Next up is Houston and their vaunted pass rush defence, Mariota is having a small sophomore slump and may lean on his running game to open up the passing lanes a bit more. Well this was an underwhelming position for both teams. Travis Benjamin and Nuk both struggled to get anything going, although Benjamin eventually put up 82 yards, and then fumbled the ball on the final play of the game. All four receivers were outplayed by the WRs playing the flex position this week, so the less said about them the better. 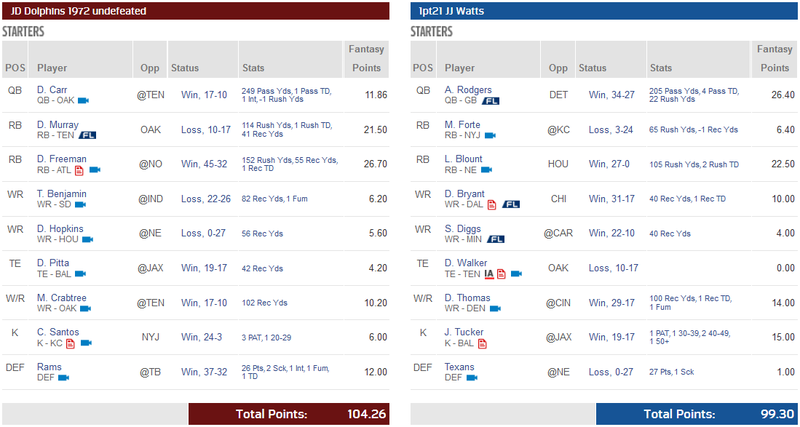 I had a last moment change of heart and decided to go with Dennis Pitta on game day and he picked up 4.20 points. Clive Walford would have outscored him if he had not had a TD cancelled out by a holding penalty in the Oakland game. I may have given up on Gary Barnidge a week early after he put up 8.60 points against the Dolphins but there will be sterner tests ahead for Cleveland and overall I expect Dennis Pitta to link up more consistently with Joe Flacco than Barnidge with the merry-go-round of QBs in Cleveland. My opponent, Guy, started Delanie Walker as his only TE option but he missed the game against Oakland putting up a big fat 0. I had had the better of this matchup for most of the game but a late 55 yard TD for Demaryius Thomas tipped the scales in Guy's favour. With Jeffery limited by a knee injury and Matthews up against Pittsburgh Crabtree seemed like the best matchup for the flex position and so it turned out to be. The fact that Jeffery and Matthews out performed both of my starting WRs is more of a concern. In the draft my opponent picked Tucker the pick before I chose Santos, and I had really wanted to grab Tucker in that round. Last week I was grateful for the points that Santos picked up for me but he was outperformed by Tucker this week. 6 points are still a decent return for a kicker and it could have been more if KC had elected to go for a 53 yard field goal early on in their game against the Jets instead of electing to punt the ball. 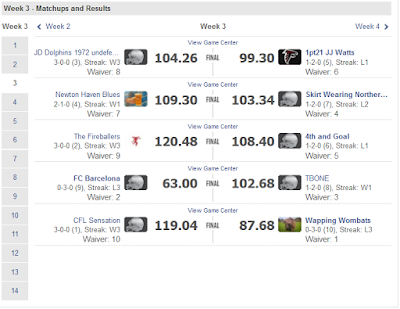 The Rams defence once again stepped up for me although they did let 26 points through. 2 sacks, an INT, a fumble recovery and a TD made up the points for me, while my opponents solitary point came from the 1 sack the Texans managed against the Patriots. The only improvements on offer for me have already been mentioned in the WR category. Both of my starters vastly underperformed although Benjamin's numbers would have looked better without the fumble. Doug Martin figures to sit on the bench for a few weeks while he recovers from a hamstring injury, Charles Sims had a good day against LA and this is something that I will have to keep an eye on going forwards in case he starts to eat into the snap count for Martin much like Coleman has with Devonta Freeman. I may look to move on Andy Dalton who has consistently put up pedestrian numbers for the Bengals, although this could improve with the return of Eifert. A major concern for him will be the fact that he has already been sacked 12 times this season. With Miami and Cleveland up in his next 4 games he could put up some good numbers, however Dallas and New England could pose a more difficult prospect for him. Guy will probably pick up The Bucket award this week, leaving a whopping 75.90 points on the bench. Jackson, Sproles and Hill would have tipped the game in his favour and despite Matt Ryan's strong performance he still didn't match Aaron Rodgers for fantasy points. 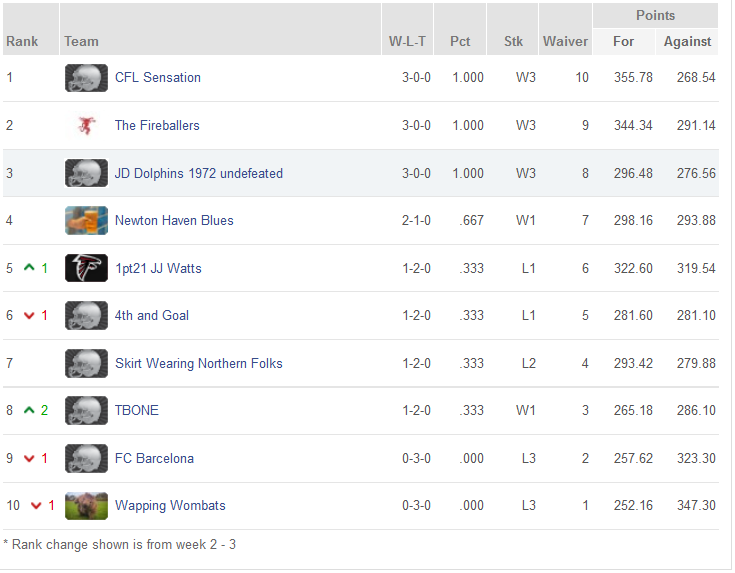 Three teams continue to remain undefeated at the top of the table, and the Dolphins are one of them. I'm not sure my nerves can take many more of these late comebacks, but fate seems to want me to come from behind and win. CFL Sensation still top the table but The Fireballers are chasing them down in second. The only other team with a winning record are the Newton Haven Blues at 2-1. Andrew's team bounced back well after losing to the Dolphins, beating Skirt Wearing Northern Folks in another nail biter. At the bottom of the table TBONE picked up their first win of the season against fellow strugglers FC Barcelona. In the top vs bottom clash CFL Sensation defeated the Wapping Wombats to send them to 0-3. Next week sees the Dolphins take on FC Barcelona who will be hoping to end their 0-3 start. CFL Sensation face 4th and Goal, who will want to turn spoilers after losing to The Fireballers in week three, and The Fireballers themselves will face Skirt Wearing Northern Folk. 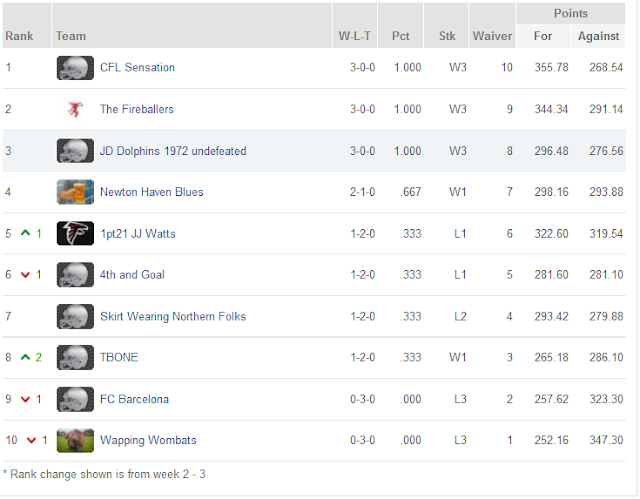 In the basement battle this week TBONE face the Wapping Wombats who are looking for their first win of the season.